#JonnOnTV: Channel 4 commissions Steph & Dom: Can Cannabis Save Our Son? 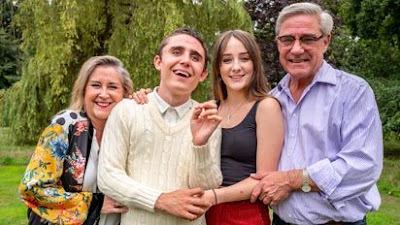 Channel 4 commissions Steph & Dom: Can Cannabis Save Our Son? Channel 4 has commissioned a 1 x 60’ film to follow former Gogglebox stars Steph and Dom Parker and their family as they face a life or death battle to try and help their 18-year-old son Max, who suffers from severe epilepsy and autism. The film is produced by Frieda.TV. In recent months Steph and Dom have been given new hope with the increasingly effective use of medical marijuana / CBD being shown to control or even eliminate the deadly seizures which blight Max’s life. But they, just like thousands of other UK families, are currently being refused this treatment for Max. This one-off film follows Steph, Dom and Honor their 15-year-old daughter, as they share their family story for the first time ever, with cameras following them at home and on their travels across the UK and the US to meet other families who have been prescribed cannabis oil, to get to the bottom of just how effective it could be, as well as uncovering the risks involved, as they try and decide whether this could be the miracle cure they’ve been looking for. With recent cases like Billy Caldwell – the boy who had his medicinal cannabis oil confiscated on the family’s return from Canada – making headline news, the question of legalising medical marijuana is once again being debated across the UK. The 1 x 60’ film was commissioned by Channel 4 Commissioning Editor, Emily Jones. Executive Producer: Jon Lloyd, Director: Erica Gornall and Editor: Sam Billinge of Frieda.tv.